Are you one among the many motorists who love their bike but when it comes to renewing their two wheeler insurance policy they forget it more often than not. If this is true, Long Term Two-wheeler Insurance is the answer to your troubles. It is a well-known fact in relation to two-wheelers that of the roughly 10 crore bikes and scooters in India over 67% of them are uninsured. Two wheelers are insured when they roll out of showrooms which can be attributed to the mandatory clause of buying insurance at the time of purchase of two-wheelers, however, it has been observed that most of the motorists don’t get their vehicle insured. To address this issue of non-renewal of two wheeler insurance, Insurance Regulatory and Development Authority of India (IRDA) has introduced long-term two-wheeler insurance policies which have a tenure of three years. New India Assurance has been first of the general insurance companies to get off the blocks. It is expected that other two-wheeler insurance companies are expected to follow suit with their own offerings. Long Term Bike Insurance is worth thinking as the advantages it offers like premium discounts and insulation from yearly increases in the third party (TP) far outweigh the disadvantages. Convenience: Long-term two wheeler insurance provides insurance cover for three years which removes the need to renew the policy every year. In today’s hectic life with so many EMI to pay one can easily miss the deadline for two wheeler insurance. Long-term two wheeler insurance addresses this very issue. Lapsed policyholders are subject certain risks in case of non-renewal of policy or till the policy is restored by paying the premium. Any motorist whose two-wheeler insurance has lapsed would not be eligible for reimbursement in case of the vehicle being stolen or damaged. The motorists would then have to bear the entire financial loss himself/herself. This eventuality can be clearly avoided for three years with the purchase of Long term two wheeler insurance. In event of two wheeler insurance policy getting lapsed the insurance company can insist on getting the vehicle checked all over again and they are within their rights on this demand. One can avoid this hassle by taking Long-term two wheeler insurance and be carefree for three years. Insurance companies have come forward on offering a discount on the own damage part of the premium of the policy. They are able to do so as they are able to save the costs associated with administrative and issuing costs. Long-Term insurance for two-wheelers saves the motorists from the annual hike in the third party premium rates which are fixed by the Insurance Regulatory and Development Authority of India (IRDA), generally, 10 to 15% hike is done on an average. Also based on their own experience insurance companies can also raise their premiums for own damage from time to time. By taking a Long-Term insurance for two-wheelers motorists can avoid this situation. 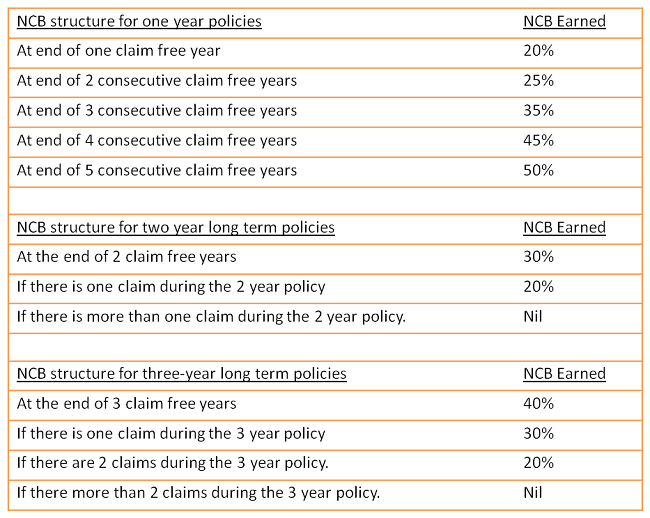 On parameter of No Claim Bonus (NCB) some of the insurance companies mention that Long-Term insurance for two-wheelers scores over one-year policy. According to industry experts, the NCB structure is different in case of renewal of a long-term policy and one-year policy. Disadvantages of Long-Term Two Wheeler Insurance includes that the insured would not be able to take the advantage of the fluctuation in the premium price, if the premium goes down the insured would not be able to take advantage of this. One also needs to compare the premium and the Insured Declared Value (IDV) of Long-Term Two Wheeler Insurance with that of one year policy. For the purpose of two-wheeler insurance claims IDV depreciates for the two wheeler as per the depreciation table that has been fixed by the IRDA for the regular One-Year policies which means that inn case of loss or damage to vehicle in the second or the third year policyholder would receive depreciated IDV of the bike and not on the IDV on which the premium for long term two wheeler insurance was paid. Let’s take an example if the IDV for one year old bike at start of the first year of a three year long term policy is Rs 50,000 then or the first year of policy IDV claim would be taken as Rs 50,000 but in the second year IDV would come down to Rs 45, 000 and in third if you could guess it would be Rs 40, 500. In Light of above mentioned disadvantages one might be compelled to think that it’s more of a disadvantage than advantage, however, the convenience of being able to pay premium for a period of 2-3 years at a instance thereby the reducing the paperwork and the task of remembering on time and the possibility of losing a No Claim Bonus (NCB) in event of even a single claim being raised during the year show the advantages having a clear upper hand over the disadvantages. Buyers are thereby advised to study and also to compare the alternatives in respect of their individual circumstances and preferences.